A key point of the Youth Development programme is to build a programme with varying degrees of impact. We begin working with large numbers of youth through the Pride and Imbewu project which reaches thousands of disadvantaged scholars per year. These trails provide an entry level introduction to environmental education and the healing power of nature; ‘planting the seed’ for a passion for wildlife and wilderness. 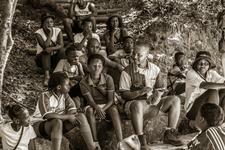 Based on its long history of using the healing power of nature for personal and social transformation and thus realisation of how powerfully young people respond to spending time in Wilderness areas, Wilderness Foundation Africa has over the years developed a number of bespoke nature interventions programmes which are also carefully developed around physical and psychological wellness of our beneficiaries. Various levels of Wilderness trails activities are integrated into each of the main three holistic intervention projects under the Youth Development banner. 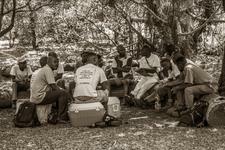 To date (since 1996-2017) Wilderness Foundation Africa and its Funders have enabled more than 66 000 disadvantaged young men and woman to access their immediate natural environment-many for the first time - engaging with their natural heritage, restoring a respect for their cultural beliefs and traditions. 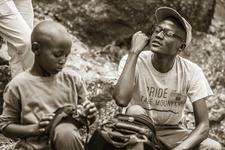 The Pride Project, which is managed and co-ordinated by Wilderness Foundation Africa, was developed to fulfil the need for an environmental education outreach programme among vulnerable youth from urban and rural areas. Pride Projects run in wilderness areas throughout South Africa in the past have introduced over 3 000 primary and senior learners to a one-day, entry-level outdoor experience every year. The experience has been proven to help stimulate the learners’ interest in their immediate natural environment and concern for its preservation and conservation. The sustained funding of 70% of the Projects’ running costs has been achieved through the sale of spring water through our funder Woolworths, which carries the Wilderness Foundation logo. Further funding is gathered from the support of various schools and private enterprises which are passionate about the project. Wilderness Foundation Africa recognizes that the sustainability of South Africa’s wild lands and wilderness is dependant on its social and economic sustainability. The Pride Project helps to instil pride and responsibility among South Africa’s previously disadvantaged youth with regards to their natural heritage. The first Pride Project was launched in 1996 in partnership with Wilderness Foundation Africa, WWF – Table Mountain Fund and Woolworths. It was named after a butterfly called the ‘Table Mountain beauty/Mountain Pride’ – in acknowledgement of where the first trail took place. To date, almost 30 000 youth have been reached through the Pride Projects. Tourists travel from across the world to come here and walk on it. It’s an intrinsic part of Cape Town’s identity and it’s one of the new Seven Wonders of the World. It also casts a heavy shadow across the city. But imagine seeing Table Mountain in plain sight every day and never setting foot on it! Through the PRIDE OF TABLE MOUNTAIN programme, over 25 000 children from the outlying areas of Cape Town have now had the opportunity to walk on the mountain and visit the world-famous gardens beneath it. Every second Saturday, from February to November buses fetch 40-50 children and take them to Kirstenbosch Gardens and then on to Table Mountain for a fun, educational walking excursion where they learn about fauna and flora. The messages of conservation, healthy living and biodiversity are clearly communicated. Outings and routes are also arranged for partially sighted, blind and mentally challenged people who may have otherwise not been able to tour Kirstenbosch or hike on Table Mountain. Most of the committed group of leaders of around 20 youth have been part of the programme for more than 7 years. Guides learn practical skills from how to give and deal with constructive criticism, to how to use leadership in everyday life. From Sipho, the eldest, who has been with Pride of Table Mountain for 18 years, to his 17-year-old son, who is the youngest and is now also a junior ranger volunteer, the programme inspires full allegiance from the Leaders. For many now, Pride is their life. Several of the leaders have gone on to take formal jobs in the eco-tourism industries and conservation. Some have opened their own nongovernmental organisations and continue the message of empowerment, conservation and overall pride in the natural beauty of South Africa. The leaders develop confidence and also enjoy increased status in their communities. “In their township, people say ‘that man takes people on tours on Table Mountain’”. Table Mountain no longer looms in the distance and has been brought that much closer to home. The Wilderness Foundation Africa Imbewu (meaning ‘seed’ in isiXhosa), project constitutes 3-day Wilderness Experiential Trails, implemented on a scheduled basis throughout the year. The aim of Imbewu is to deliver quality primary outdoor experiences to stimulate, spark and inspire interest in the natural environment and conservation. This project also aims to provide our community the opportunity to rediscover the relationship between their cultures and nature through the power of education and the experience of their natural heritage: wilderness areas, national parks and their immediate natural environments. The Imbewu project is run as a joint partnership between the Wilderness Foundation Africa and the People & Conservation Department of the South African National Parks. To provide previously disadvantaged school children the opportunity to experience wild places for the first time, educating on the importance of caring for and preserving our natural areas & environment. To utilize the power of experiential learning to provide learners with knowledge & understanding of their immediate natural habitat & the importance of ecological preservation. To provide youth with an opportunity to rediscover the relationship between their cultures and nature through the teachings of elders in a wilderness setting. Developing the skills capacity of young community volunteers through relevant training, experience and leadership enhancement and to recruit these potential leaders from trail participants. Introducing youth from disadvantaged backgrounds to experience the wilderness environment in our National Parks. Providing youth with an opportunity to rediscover the relationship between their cultures and nature through the teachings of elders in a wilderness setting. To deliver a youth empowerment initiative that offers a quality experience which restores self-identity and natural heritage links, developing an environmental consciousness and ethos. While Wilderness Foundation Africa continues to direct large amounts of its funding resource (utilizing unspecified grants) to advocacy and awareness campaigns related to its Forever Wild Rhino Protection Initiative launched in May 2011 in response to the heightened rhino horn poaching in South Africa, it is also very clear that unless this is supported by other strategies aimed at reducing the demand such as experiential education and exposure of people to their natural heritage, these efforts may still fall short from achieving their intended objective. Developing young South Africans who are aware of the value and power of nature and as they grow older influence others positively with this knowledge. Developing young people and youth leaders who have completed a wilderness trail with the Foundation to carry the deeply spiritual connection we have with the earth into their futures and share the message of conservation with the families, communities and society in general as they grow in influence. To harness the impact that wilderness trails have on young people’s ability (personal growth) to recognise their own inner strength and resilience and guide youth to apply this towards reaching their dreams. By including wilderness trails in all skills development projects the foundation hopes to harness the healing and inspiring power of nature to give young people a boost towards their new futures.